Former President Bill Clinton defended his family’s foundation amid mounting conflict-of-interest questions, claiming there’s nothing “sinister” at work — while saying he might consider stepping down as foundation president if his wife wins the presidency. Clinton addressed the issue during an interview aired Monday on NBC’s “Today” show. The interview comes as media reports raise questions about donors potentially benefiting from their relationship with the Clintons. “And there’s almost no new fact that’s known now that wasn’t known when she ran for president the first time,” he said. 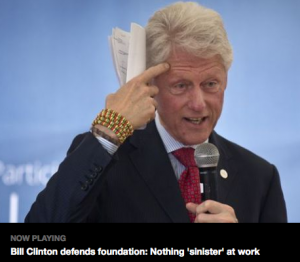 As for the foundation’s work, Clinton said there’s nothing “sinister” in trying to get wealthy people and countries to spend money in a way that helps the poor.